PROFITS SOARED TO more than €3 million at Dundalk FC last year following the club’s historic Europa League campaign. According to new accounts just filed for Dundalk Town FC, the club reported a €3.3 million profit in the year to the end of November 2016. This compared to profits of just under €143,000 during the 2015 financial year. The increase in income follows the club’s historic Europa league campaign. Dundalk reached the group stage of the Europa League, only the second League of Ireland side ever to do so. The team also made history by beating Maccabi Tel-Aviv 1-0 to become the first Irish team to earn a European group stage victory. 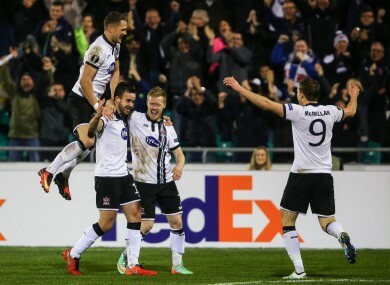 Although Tel-Aviva overturned the Lilywhites 2-1 in the return fixture in December and Dundalk exited at the group stages, the experience still proved to be a lucrative one for the League of Ireland champions. Teams earn bonuses for reaching European play-offs and groups, and more again for draws and wins. The new accounts for Dundalk show that the club’s recievables rose from just under €400,000 in 2015 to €3.5 million in 2016. Receivables include money that is owed to a firm that has not yet been paid but is counted as an asset as it is expected to be paid in the near future. The cash and cash equivalents held by Dundalk also soared during the year, rising from just €1,804 to €1.2 million. The number of staff remained largely static, increasing marginally from 25 to 26. Some 21 players were employed by the club during both years. Staff costs rose dramatically during the year, increasing from just under €1 million to almost €3 million. After paying various debts, the firm was left with income of €3.3 million. The windfall marks a dramatic turnaround in the financial fortunes of Dundalk, which was on the brink of going out of business in 2012. Businessmen Andrew Connolly and Paul Brown led a local group in taking over the club from owner Gerry Matthews, after which it went on to win the League of Ireland three years in a row. The third league win coincided with its European campaign in 2016. Last year also saw the club take full ownership of the lease for Oriel Park and the Youth Development Centre building after resolving a long-running dispute with Matthews. This year the club has struggled to replicate its best form following the departure of several key players. While it sits in third in the league, Dundalk is a long way off first-placed Cork City. Email “Profits at Dundalk FC shot up twentyfold after its historic Europa League campaign”. Feedback on “Profits at Dundalk FC shot up twentyfold after its historic Europa League campaign”.